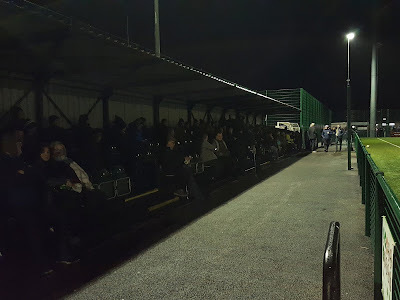 My tenth ground of 2019 was on Saturday 9th March at Ruskin Drive in St Helens, Merseyside. The match was St Helens Town vs. Garstang in North West Counties League Division One North. The ground is part of a sports and leisure complex at Ruskin Drive. The site also includes pitches for rugby, football, cricket and bowls as well as a health and fitness centre and a bar. The ground is bordered by a road with housing beyond on its north-west side and is otherwise surrounded by the rest of the sports complex. The ground is 1.5 miles north-west of St Helens Central railway station and was completed in 2017. After spells groundsharing with the St Helens rugby league side, Ashton Town, Ashton Athletic and Prescot Cables this marked the first permanent home for the club since leaving Hoghton Road in April 2000. 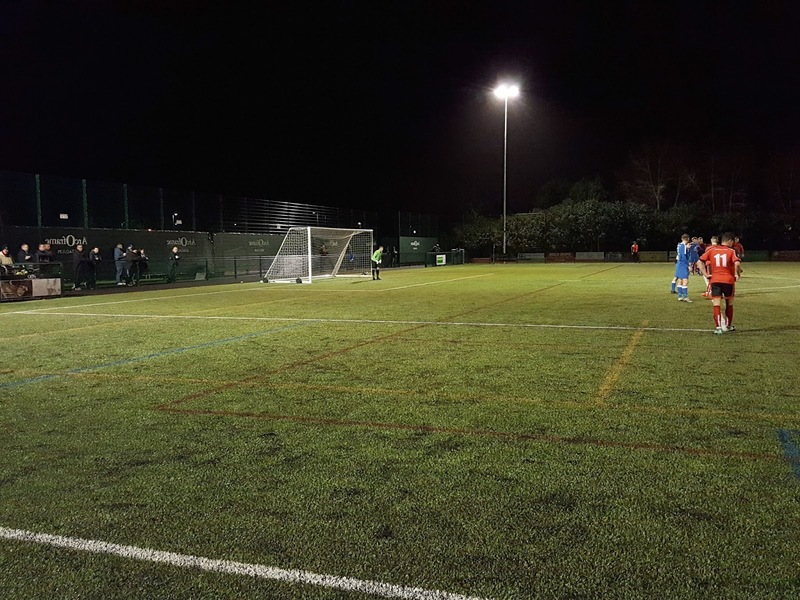 The ground is one of the new cage arenas with a 4G pitch. It is a three-sided ground as far as spectators go with the south-west side not available for spectators with trees running up to the edge of the cage. The two dugouts are however located on this side of Ruskin Drive. The main side of the ground is the north-east side. This has an all-seater stand with a capacity of 200 which at present is the only stand at the venue. The rest of this side is uncovered hard standing which is fairly spacious for the most part though there are sections either side of the stand where the fencing juts in narrowing the space. In the northern corner, next to a rugby pitch just outside the confines of the cage, there is a large shed for officials and committee members to shelter and have food and drinks. The areas behind the two goals are both uncovered hard standing. The entrance to the arena is on the south-east side of the ground and just outside the cage is a food outlet and a club building with dressing rooms and toilets. There is no clubhouse for spectators at present but with it being on the wider sports complex the clubhouse and bar offers this service. St Helens Town went into the evening hovering just above the drop zone while Garstang were safely positioned in mid-table. 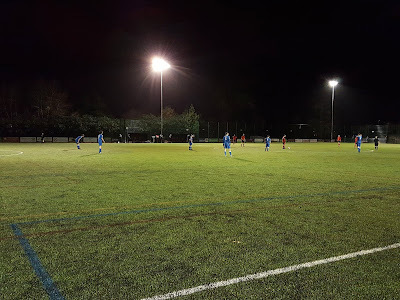 The visitors got their noses in front in the 12th minute when a cross from the right saw Richard Coar get in ahead of a defender at the near post to head home. 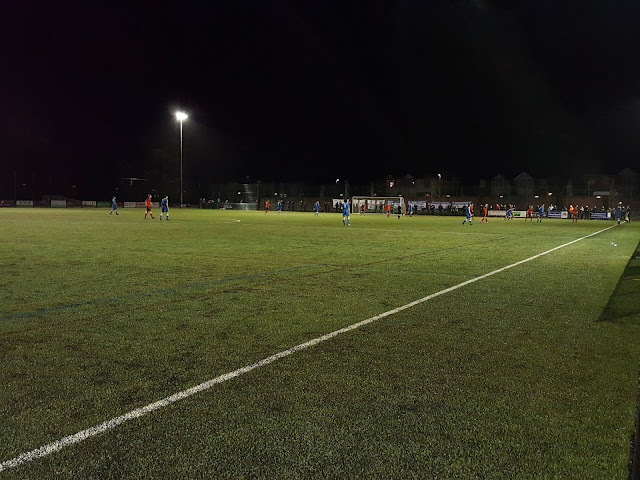 The home side thought they had equalised in the 22nd minute - Neal Weaver went down the left, got into the area and shot at Garstang keeper William Kitchen. The shot was fumbled out to Liam Diggle who slid the ball home but turned to his right to see the flag raised for offside. Four minutes later Diggle was denied again this time by Kitchen who tipped over a shot when the St Helens striker was clean through. This was the last meaningful action in what was a poor first half. Just three minutes after the break things got more interested as St Helens equalised. A corner sailed into a crowded box and Diggle managed to get a touch to it to nod over the line and get the goal he should have had in the first half. The home side were a different team in this opening spell of the second half creating a number of chances. This changed on the hour mark when Garstang's Shaun Sailor picked up the ball 30 yards from goal, danced through two challenges to get into the area before rifling the ball into the roof of the net. From this point on the visitors controlled the game and with a quarter of an hour remaining extended their advantage from the penalty spot. It was awarded when Billy McKenna got in on goal and was felled as he went to pull the trigger to shoot. Jonathan Hothersall was on penalty duties and though his spot-kick did hit Carl Williams on the way through there was too much power for it to be saved. The away side almost added a fourth in the 80th minute when Richard Coar picked up the ball on the left of the area and shot at goal requiring a good save from Williams to keep the score down. There was never any danger of St Helens getting back into the game though and it was quiet after this with Garstang coming out 3-1 winners on the night.